The Daily Good Turn, this Norman Rockwell painting, appeared on the cover of Boys' Life published February 1919. An alternate title for this painting is Scout Helping Gentleman Cross Street. This event marked Rockwell's twelfth cover publication for Boys' Life. This painting was originally published as part of an article in the November 1918 Red Cross magazine. That article featured three other Rockwell paintings, all Boy Scout related. Long before the Boy Scouts magazine published this painting on its cover, readers had become familiar with him through his article and story illustrations and also other cover illustrations for this and other magazines. Rockwell had already served as the art director of Boys' Life from 1913 through 1916. By 1919, Norman Rockwell was very much in demand as an illustrator. He simply didn't have the time to paint a cover for Boys' Life. 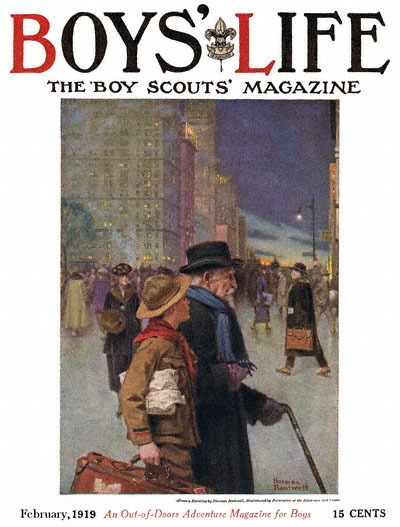 Boys' Life was forced to reprint a painting from another magazine if it wanted Rockwell on its cover. Boys' Life was still a fairly new publication at this time. The first issue had just been published in 1911. However, both Boy Scouts and Boys' Life had become firmly established in American culture by 1919. Both would become American cultural institutions. And Rockwell was well on his way to achieving icon status as America's favorite illustrator. This painting is one of four Norman Rockwell paintings used to illustrate an article about Boy Scouts. The Red Cross wanted to commend the Boy Scouts on their fine work on the home front during World War One. This particular painting memorializes the Boy Scout tradition of doing at least one act of kindness each day. This habit helps to focus the Scout on service to others. The good deed for today shows this Scout helping an elderly gentleman cross a busy city street. It is a cold wintery day. The Scout could be at home where it is warm. Instead he is focusing on service and doing a good turn. In today's language, he is paying it forward.